Located in the Piedmont Triad near the Elon University in Burlington, the Burke Manor Inn is a historical and luxurious bed and breakfast inn offering eight beautifully appointed guest rooms with private bathrooms and modern amenities. Designed for comfort and privacy, the Inn is nestled among 3.5 acres of well-maintained gardens and grounds with lovely verandas and patios on which guests can relax and is home to the award-winning fine dining restaurant, Saint Jacques @ The Burke Manor, which serves dinner from Thursday to Saturdays. The Burke Manor Inn is located just a block away from Highway 100 and a few miles from the Stony Creek Golf Club and the Burlington Artists League. The Burke Manor Inn boasts eight beautifully restored and individually decorated guestrooms furnished with beautiful antiques and period reproductions. Six of the guest rooms are located in the main Inn, and the remaining two rooms are set in two private vacation cottages next to the main building. All rooms feature original oak floors, king or queen-size beds with luxury linens, and private, en-suite bathrooms with European body massage showers, or Jacuzzi spa tubs and separate showers, plush towels and bathrobes, and designer bath products. Modern amenities include individual climate control, cable LCD/DVD combo TVs, alarm clocks, irons and ironing boards, and complimentary high-speed wireless Internet. Additional services include daily housekeeping. The Paris Cottage is a premium bungalow suite just steps from the main Inn and is decorated in deep hues of red and gold with French accents. The quiet suite features a king-size bed with deluxe linens, and an en-suite bathroom with two-person Jacuzzi air and water jet tub and shower, plush towels and bathrobes, and designer bath products. A spacious living area has comfy seating, as well as a fridge, coffee maker, flat screen TV/DVD and complimentary wireless Internet and a private patio has lovely garden views. The Provence Cottage is a stand-alone just behind the main Inn and features a separate bedroom with a wrought iron queen-size bed in luxury linens, and an en-suite bathroom with a standard bathtub and shower, plush towels and bathrobes, and designer bath products. A sitting room offers a double sleeper sofa for extra guests, along with amenities such as a fridge, coffee maker, flat screen TV/DVD, and complimentary wireless Internet. Aptly named, the Perch Penthouse is located on the third floor of the Inn and offers 400 square feet of open plan space with a king-size bed in luxury linens, and an en-suite bathroom with a deep two- person jacuzzi tub and separate shower, plush towels and bathrobes, and designer bath products. A sitting area features comfortable arm chairs and a cozy nook with a day bed for extra guests and modern amenities such as a flat screen TV/DVD and complimentary wireless Internet. This loft-style apartment is right next to the communal area, which had a microwave, refrigerator and coffee maker. A full hot breakfast is served every morning in the formal dining room and includes a variety of egg dishes paired with bacon or sausage, freshly squeezed orange juice, locally brewed artisan coffee and organic teas. 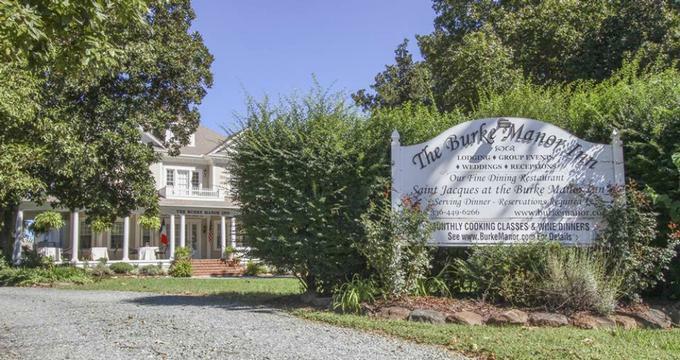 Complimentary snacks and beverages are available in the front parlor throughout the day, and a fine dining experience can be savored at the award-winning Saint Jacques @ The Burke Manor Inn between Thursday and Saturday. Named one of the top 100 restaurants in the country, the AAA, 4-Diamond restaurant serves exceptional French cuisine in an elegant setting. The Burke Manor Inn offers a variety of amenities and facilities for guests to enjoy, ranging from a scrumptious gourmet breakfast served every morning in the dining room or on the veranda in the warmer months, exquisite gardens and grounds in which to relax, and an award-winning fine dining restaurant, Saint Jacques @ The Burke Manor Inn, which serves dinner from Thursday through Saturday. The Burke Manor Inn provides a year-round and garden wedding and reception venue for weddings, celebrations, business meetings and other special events for up to 350 guests. Renowned as being one of the premier event venues in the Piedmont Triad, the Inn boasts exquisite gardens and manicured lawns, a large pavilion, award-winning cuisine, and exceptional kitchen and professional staff to take care of every detail. The Inn offers a variety of packages for intimate weddings, elopements, receptions and weddings for up to 350 guests.